It’s about territory, food, and competition. Not to mention Egrets are not particularly nice. 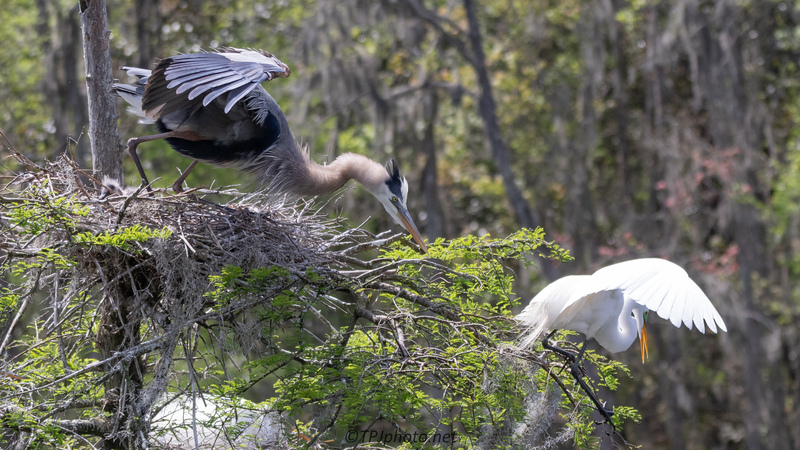 At any given moment a Great Egret can fly in on a Heron nest, or close to it. With luck an adult is standing guard. Great Blue Heron are fairly calm birds and the Egrets keep coming back and pushing their luck. 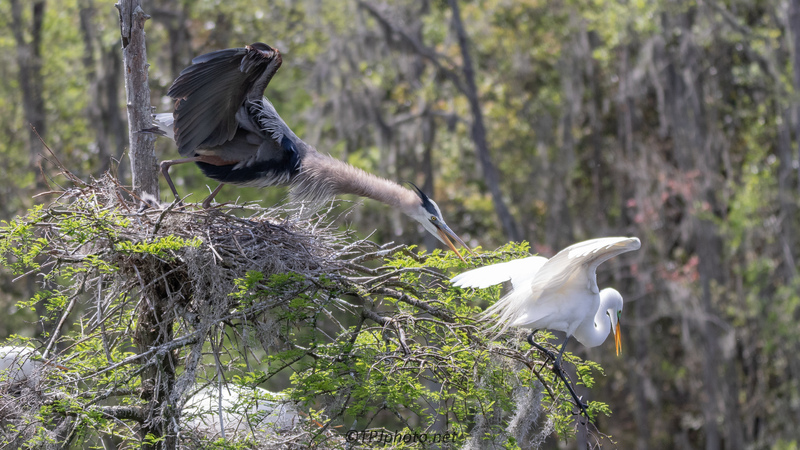 Ultimately the Great Blue loses patience and goes after the Egret. Both birds are large with formidable beaks. Being predators they know how to use them. A smart Egret, being one on one with a big Heron, will retreat quickly. Herons are loud also which is what draws my attention to these interactions. It will get more interesting as time goes by. Once young Herons can stand and move around it takes both parents hunting to keep them in food. In the nest alone it will be them fighting off Egrets, and now the Heron young are the smaller birds. I learned today something very interesting about Great Blue herons and Great egrets. Ted, you captured a very unique moment. The photos are so great!!! Thank you. 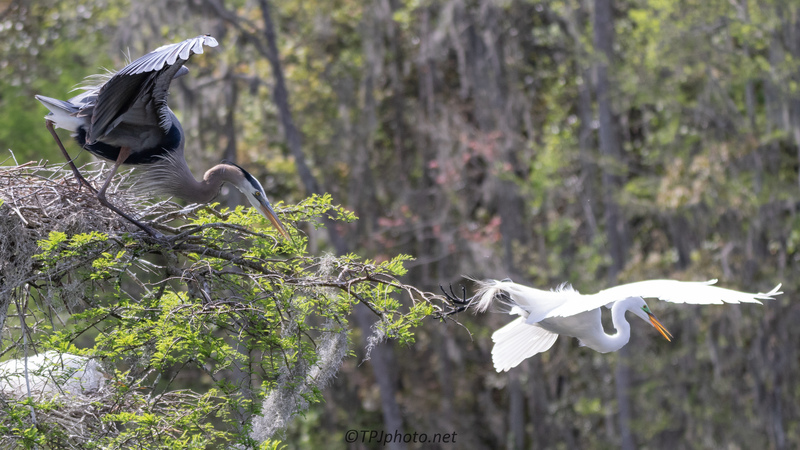 So far I have missed capturing the last ‘bully’ of the swamps, Anhinga. They may be a little smaller but no less aggressive. 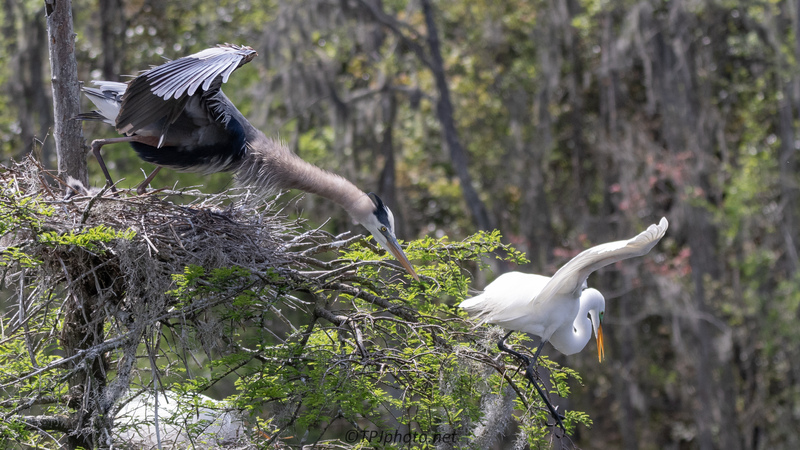 When I have not been there Anhinga have forced Egrets out of nests.